Our Curiosity Cupboards are all made by hand in our Leicestershire workshops. 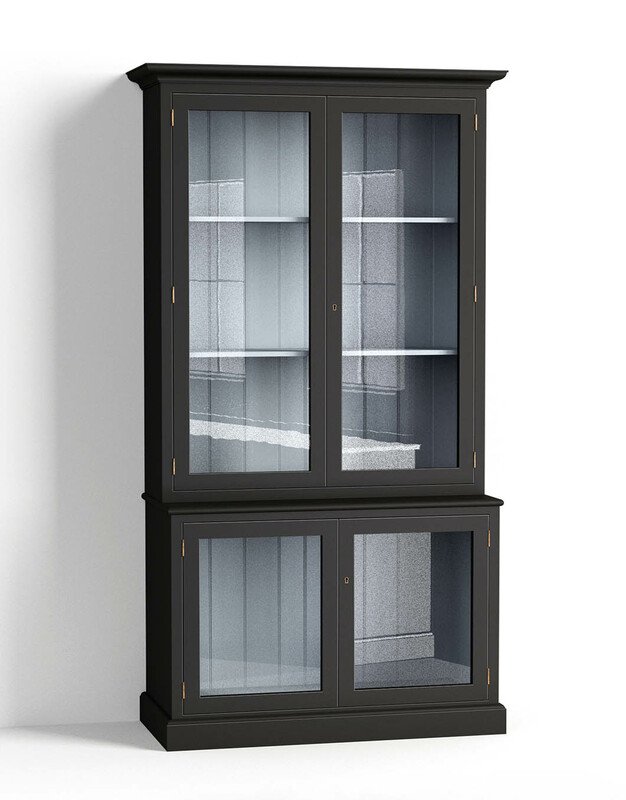 Inspired by old museum display cabinets, this freestanding glazed cupboard is designed to house unusual and interesting objects and is also a curiosity in itself. We've kept this classic design feeling light and elegant by using big glazed doors with narrow frames. The tongue and groove panelling and delicate lock and key are really simple little touches that make these cupboards so special. We can paint your cupboard in any of our standard Shaker colours, inside and out, at no extra cost. The Curiosity Cupboard is available in three standard sizes which can be stacked together to create longer banks. Bespoke sizes are also available. 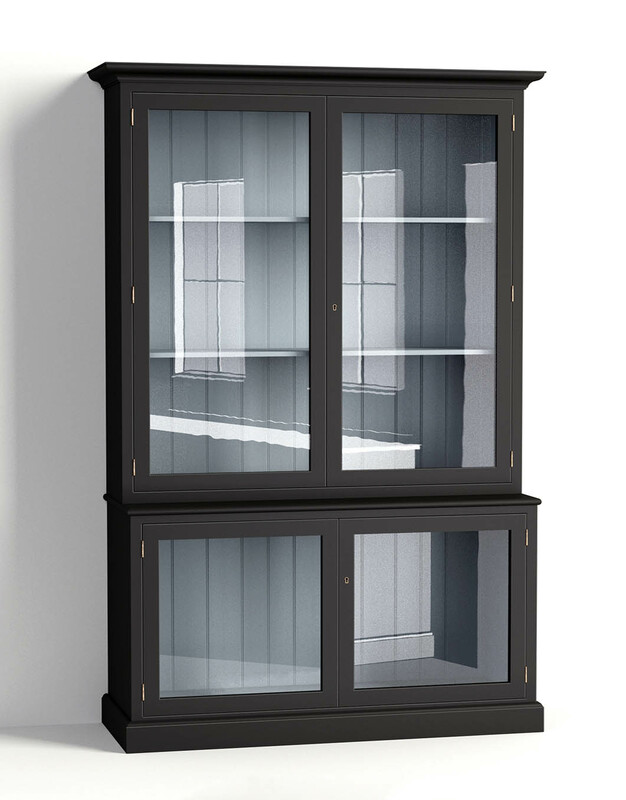 Please be aware that these cupboards require a small amount of installation on delivery. For more information or if you would like to place an order, please contact enquiries@devolkitchens.co.uk or call us on 01509 261000. What’s in a name? Well, quite a lot. We tend to go for something quite straightforward when we’re naming new pieces of furniture, the ‘Shaker Pantry Cupboard’ or ‘Classic Prep Table’, it does what it says on the tin, but the Curiosity Cupboard is a little bit different. 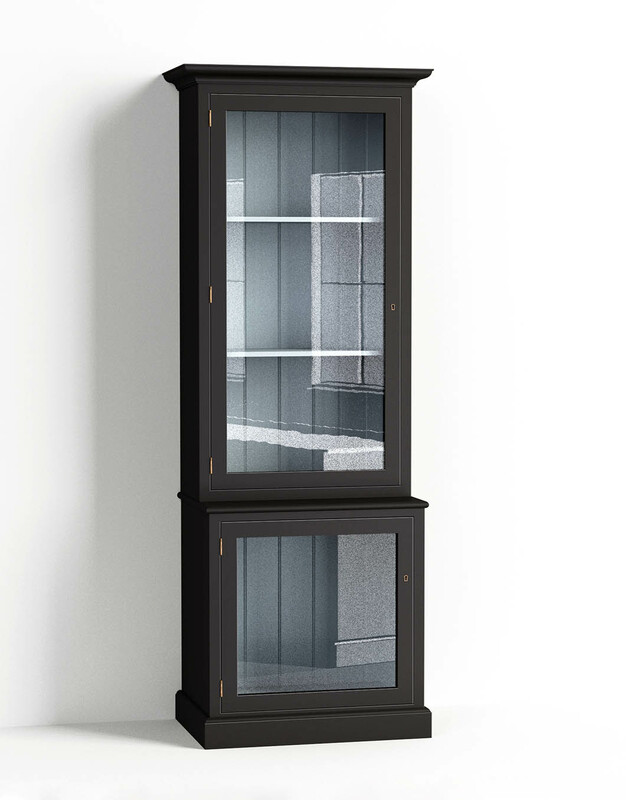 Inspired by old museum display cabinets, this freestanding glazed cupboard is designed to house unusual and interesting objects and is also a curiosity in itself. Its unique style has caught the eye of some of the biggest names in interiors including online sourcebook giants, Remodelista, and the world’s most influential design magazine, The World of Interiors. 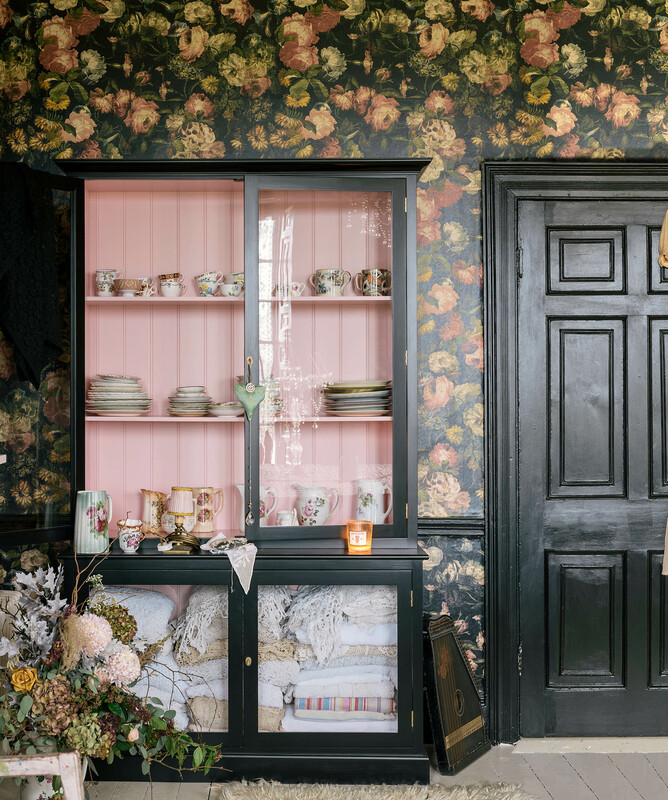 Opened by lock and key, this piece is perfect for displaying your most precious curiosities, from quirky trinkets to your favourite crockery and glassware. 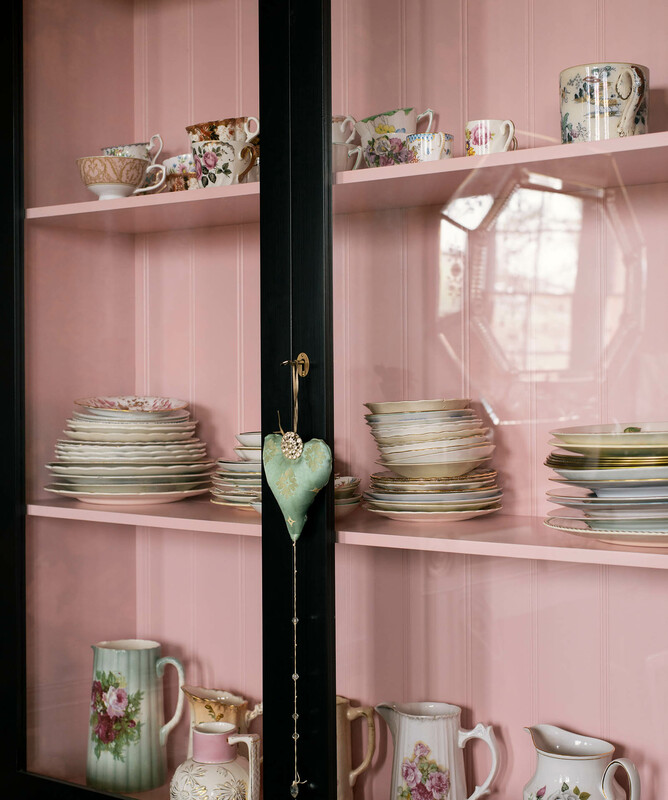 It’s quite an unusual feature to have both sections glass-fronted, it allows larger items like big copper pans or bundles of pretty linens to be stored in the base cupboard whilst smaller more delicate pieces can be displayed on top. The tongue and groove panelling is the perfect backdrop, a subtle detail that shows the quality of the carpentry. More akin to a vintage piece added at the end of a project, it works wonderfully as part of a deVOL kitchen or as a standalone piece in any room of your home. 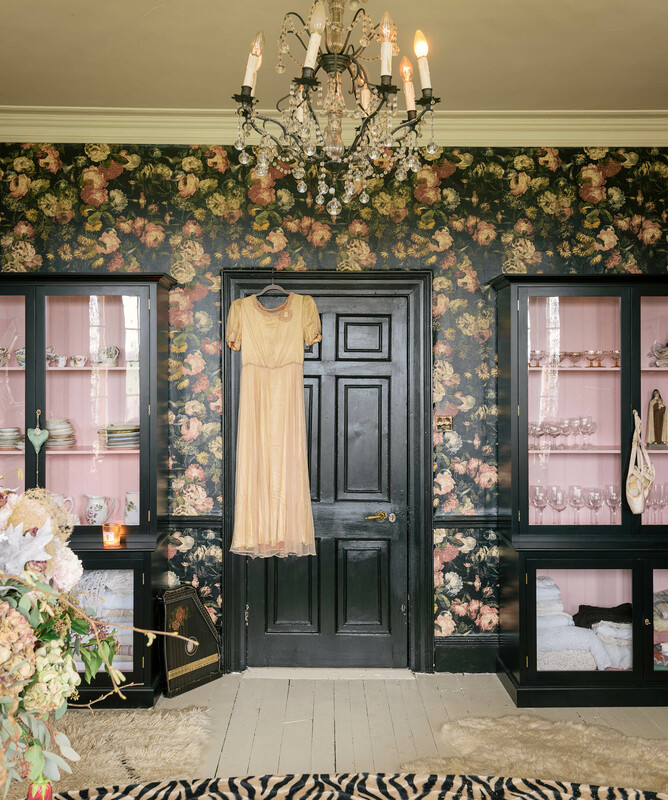 After working with deVOL to create her dream kitchen, style icon Pearl Lowe decided that two of our new Curiosity Cupboards would be the perfect addition to her fabulously glamorous dining room. 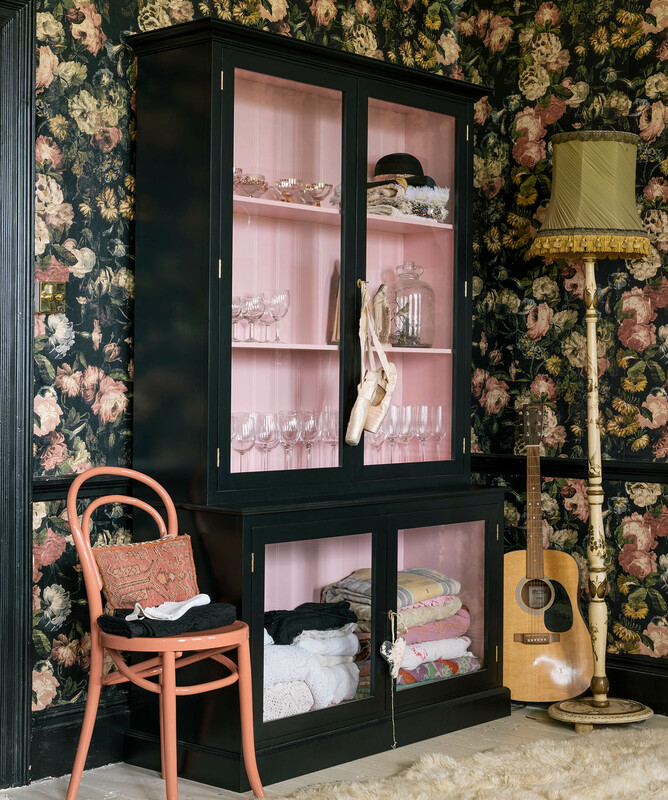 The combination of the floral House of Hackney wallpaper, pink and black cupboards and quirky accessories is just so spot on, but we wouldn’t really expect anything less of Pearl’s style choices. She seems to have perfected that romantic-glam rock look so effortlessly, mixing prints, colours and textures in a way that most dream to but in reality would probably be quite scared to attempt. Pearl chose this cool pink and black combination but the colourways for this piece are endless. Pantry Blue and Damask are our favourites but the all-black cupboards that we showed at last year’s Clerkenwell Design Week looked so stylish too. We can’t wait to see what colour combinations our customers come up with and we're sure that we''ll be seeing lots of these beautiful cupboards in their homes in 2018.